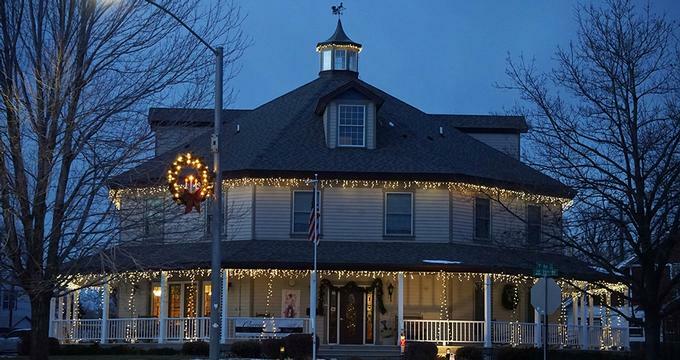 The Currier Inn Bed and Breakfast is an elegant and traditional bed and breakfast with the grace and charm of a bygone era and the upscale conveniences of the modern day. Located in the heart of Estes Park, the Currier Inn Bed and Breakfast features ten beautifully appointed guest rooms with plush, country-style décor and antique furnishings, private bathrooms with soaking tubs and showers, modern amenities and lovely garden views. The Inn has a shady wraparound porch with outdoor furniture and garden views, and guests can enjoy a complimentary cooked-to-order breakfast in the elegant dining room every morning. The lodge also features a comfortably furnished living room with ample seating and a wood-burning fireplace, and there is free onsite parking at the Inn. The Currier Inn Bed and Breakfast is a short walk from the Colorado Model Railroad Museum, the Sunset Memorial Gardens, and the University of Northern Colorado. The Currier Inn Bed and Breakfast feature ten beautifully appointed guest rooms with plush, country-style décor and antique furnishings. All guest rooms have king or queen-size pillow-top beds dressed in high-quality linens, down or hypoallergenic comforters, classic French Toile bedspreads, and pillows, and en-suite or private bathrooms with shower/bath combinations, separate showers, and soaking tubs, single or double vanities, lighted make-up mirrors, plush towels and bathrobes, and organic bath products. Sitting areas have plush sofas and overstuffed armchairs, writing desks and chairs, and large windows with stunning mountain views. Modern amenities in all suites include individual climate control with heating and cooling functions, mini-fridges, flat-screen televisions with cable channels, clock radios, irons and ironing boards, and complimentary high-speed wireless Internet. Guest rooms include the Henry West Room, the Boyd Room, the Sterling Room (ASA), the ‘Seven Four One’ Room, the Horace Greeley Room, the Nathan Meeker Room, the Robert Cameron Room, the Colorado Room, the Shawsheen Room, and the George W. Currier Room. Deluxe amenities at theCurrier Inn Bed and Breakfast include a comfortably furnished living room with ample seating and a wood-burning fireplace, and there is free onsite parking at the Inn. Guests can enjoy a complimentary cooked-to-order breakfast in the elegant dining room every morning, and a shady wraparound porch has outdoor furniture and beautiful garden views. The Currier Inn Bed and Breakfast is located in Estes Park and is within walking distance from several attractions, including the Colorado Model Railroad Museum, the Sunset Memorial Gardens, and the University of Northern Colorado. Other attractions in the area include the Rocky Mountain National Park, the Roosevelt National Forest, the Indian Peaks Wilderness, and the Arapaho National Forest. Spanning the Continental Divide and encompassing the protected mountains, forests and alpine tundra of northern Colorado, the Rocky Mountain National Park is a United States National Park in north-central Colorado. Situated between the towns of Grand Lake to the west and Estes Park to the east, the Rocky Mountain0 National Park is bisected by the Continental Divide and features spectacular natural scenery of wooded forests and alpine lakes, rugged snow-capped mountains and rocky tundra, and an abundance of fauna and flora. The Park is surrounded by National Forest Lands, including the Roosevelt National Forest, the Routt National Forest, the Arapaho National Forest, and the Indian Peaks Wilderness. Famous attractions in the Park include the Trail Ridge Road and the Old Fall River Road, the Keyhole Route, Longs Peak, and Bear Lake and the Park have five visitor centers, including the Beaver Meadows Visitor Center where the park headquarters are situated. The Rocky Mountain National Park was designated a UNESCO World Biosphere Reserve in 1976 and received over four million visitors a year. The Currier Inn Bed and Breakfast offers a range of modern conference space and flexible facilities for corporate meetings and off-site strategic planning functions. The Inn’s state-of-the-art facilities include an adaptable space for up to 40 delegates equipped with modern audiovisual technologies and smaller rooms for private break-out sessions. Additional services include professional catering, event management services and a variety of concierge services.